Adults aren’t the only ones who can be self-conscious about their orthodontic treatment. The visibility of silver braces can affect a teen’s confidence, or even make them not want to straighten their teeth at all because they are afraid of getting teased. Fortunately, the makers of Invisalign understand this, and they have created an orthodontic treatment program specifically for teens. Invisalign Teen works just like Invisalign for adults. The patient wears a series of invisible plastic aligners that move the teeth into their proper positions over several months. These aligner trays are removed when patients eat or brush and floss their teeth, but they should be worn the rest of the day and night. Replacement trays - Things happen. The family dog eats an aligner, an aligner gets thrown away with the trash at lunch or lost at a friend’s house. Invisalign Teen provides up to six free replacement aligner trays for these types of occasions. Color indicators - With everything going on in their lives, teens can forget to put their aligners back in, or they may get tired of taking them in and out when they eat and decide just to leave them out. To make sure teens are receiving treatment a minimum of 22 hours a day, their trays have blue dots that slowly fade as they are worn. Room to grow - Some teens may be ready to start their treatment, but they are still missing a few adult teeth. Invisalign Teen leaves room for these teeth to come in during treatment. 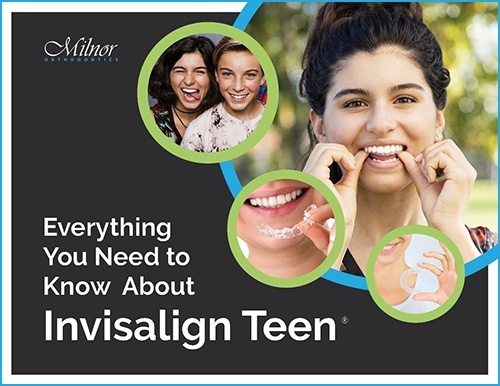 Don’t let the fear of being teased or getting food stuck in their braces keep your teen from getting the smile they’ve always wanted - talk to Dr. Milnor about Invisalign Teen. 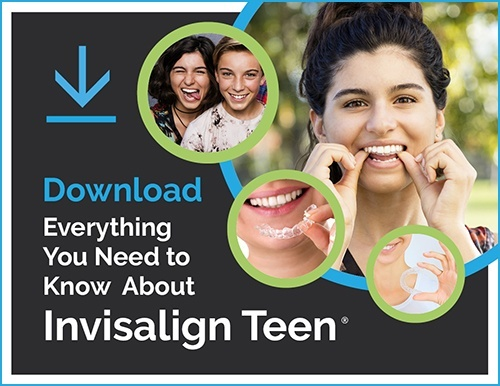 Everything You Need to Know About Invisalign Teen!